Here is how to alter a stamped image with this simple Colouring Tutorial and make it look different each time you use it. Do you get bored using the same stamp time and time again? And do you want another way to alter the look? Or perhaps you don't think that you can colour in images with a good result. Maybe you don't have the time to sit and colour them in or maybe you just don't want to. Then why not consider this little technique to give a you a different look to those stamped or printed digital images that you have sitting in your "Stash". You don't need any special skills or even be able to draw. This basic colouring tutorial will show you how to get an individual look for your designs with just a colouring pen. Once you have added the hatch markings to your chosen image you could leave it at that if that was the look you liked. Or you could do as I have done and colour the blocks in alternately for a diamond effect. 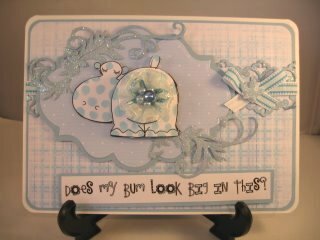 This cute blue Hippopotamus is done with large polka dots and she looks just as pretty. 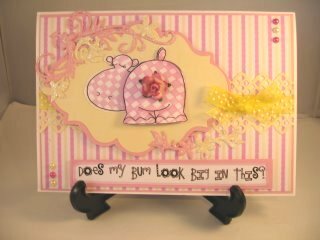 This is Hettie and she is a digital download from the "Does my bum...." collection from Pink Petticoat. But I have had her a long time and I don't know if she will still be available for you to buy. Although there is Ella the elephant in the same theme. You will find her in the Retiring Collections on their website so you will have to be quick if you want the image. And there are many ways to use this delightful image on your cards. It may be a good idea to go through any stamps that you have and re think the way they can be coloured and used.